What a completely elegant way to serve strawberries or some other goodies to a special someone or at an elegant party. Take a solid bowl (glass or metal because plastic bowls will tend to shift and can crack chocolate) and use thin foil to cover the outside of the bowl. Melt chocolate or candy melt/almond bark and keep drizzling over foil to create a nesting look. Make sure to get enough so it will be strong and don’t forget to get the ridges of the bowl and the bottom.You can do a two-tone effect of white chocolate/dark chocolate or three if you added a medium colored chocolate. DO NOT FREEZE as this will make the chocolate very brittle. Air dry the chocolate at least eight hours. Gently turn bottom of your new bowl so it is sitting on its bottom. Pull foil away from glass/metal bowl and then remove glass/metal bowl. Then gently pull away from your chocolate bowl. Slight breaks can be fixed with some patching (melt chocolate and hold a piece of foil on the underside of your chocolate bowl and drizzle to repair and hold for a few minutes. Let dry completely before you pull foil away. Your new bowl is ready – would make a great way to serve Mom or Dad a breakfast of fresh strawberries for Mother’s / Father’s Day. For Diabetic’s use sugar free chocolate and if you want to lower calories the rule of the darker the chocolate is the better. 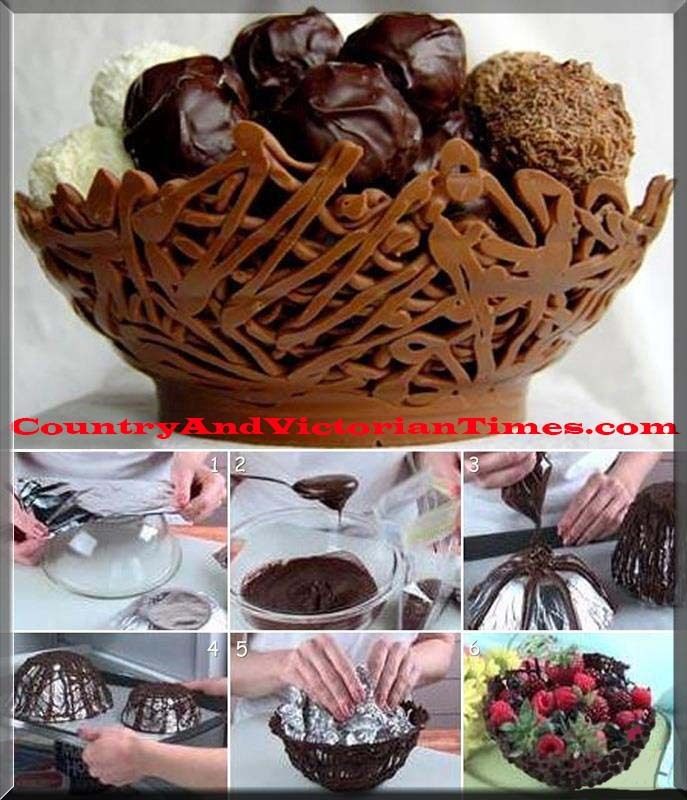 This entry was posted in Crafts ~ DIY ~ Projects, Recipes, ~Breakfast, ~Dessert, ~Easter, ~Father's Day, ~Food, ~Gifts, ~Mother's Day, ~Party, ~Party Items, ~Snack and tagged bowl, chocolate, Confectionery, create, dark, Drizzle, elegant, Garden strawberry, medium, milk, mothers day, nest, serve, Shopping, strawberries, strawberry, table, white, ~Food, ~Party. Bookmark the permalink. Perfect idea especially for tomorrow being Mothers day! I’m sure a lot of chocolate loving moms out there will love this! I think it would make a great gift filled with chocolate covered strawberries and specialty chocolates. It will make a Mom’s eye’s go wide especially when she finds it was made by you.